Will a new Modern UI arise in 2015? Check your email right from the Start screen? An interactive user interface looks to be a major part of Windows 9, along with its other assigned task of reviving the desktop. Winbeta reports Microsoft's next operating system, codenamed Threshold, will include interactive Live Tiles and a notification center as part of a Modern UI update arriving with the OS. While we've already seen Live Tiles incorporated in the returning mini Start menu, Winbeta suggests this functionality could extend to the Start screen as well. Supposedly these particular Live Tiles will let users view information such as emails without actually having to open the email application itself. The feature was previously seen in April at Microsoft Research's TechFest 2014, but now it seems the feature could become a consumer-facing reality. Live Tiles may also be incorporated into some, but not all, of Windows 9's main apps. Third-party applications could get support for the interactive functionality but developers will have to update their software accordingly. 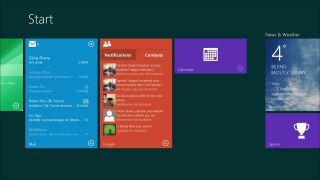 A notification center could also be another new feature coming to Windows 9. Much like the notification center Windows Phone 8.1 introduced, this panel could give users a quick overview of new messages, app updates and the like. Sources in the know of Microsoft's Windows 9 plans are unsure whether these two features will appear in the technical preview rumored for a September 30 unveiling. All the news we've heard about Windows 9 suggests Microsoft is taking a hardline stance on bringing back an OS designed for desktops. This includes doing away with the Charms bar on PCs and laptops, as well as the Start menu coming back. When will we see all these new Windows 9 features (and omissions?) According to Winbeta, the Windows 9 release is set for 2015. Plenty of time for more rumors to crop up. Will Windows 9 include Cortana as rumored?